The Country Women’s Association (CWA) of New South Wales has today announced a commitment of up to $50,000 from its Disaster Relief fund, to assist the victims of the Sir Ivan fire with their immediate needs. The CWA also formed a committee with the community of Dunedoo yesterday to manage the many generous offers of assistance that are rolling in for people affected by fire. 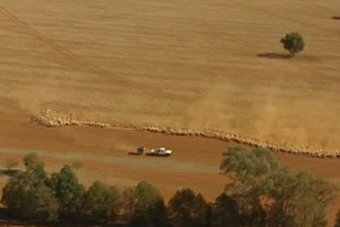 According to CWA of NSW’s President, Annette Turner, 31 properties have been confirmed as destroyed but crop and stock loss assessment has only just begun and is escalating. “Latest reports late yesterday from the Rural Fire Service indicated the 55,000 hectare fire was only just under control and many farmers have lost absolutely everything,” said Annette. “Our Disaster Relief fund is for exactly these types of situations and we are very pleased to be able to assist. Food, clothing and financial donations are what is most needed at the moment and I encourage everyone who is able to to donate and support those affected,” she said. Clothing and food donations are being co-ordinated by Dunedoo Central School office staff (call 02 6375 1489 for details of where and how to deliver or collect). No furniture deliveries will be accepted at this time as those affected have nowhere to store them. Short term accommodation is being organised and those requiring it should contact Sharon Nott on 0428 859 509. Hay and grain deliveries are being co-ordinated by Hayden Rhodes and Sandy Cox from Delta Sullivans – contact 02 6375 1209, Hayden on 0428 811 774 or Sandy on 0428 865 299. Counselling for fire victims is being arranged and Dunedoo Central School have a counsellor coming in for student assistance. Townspeople are on hand to do basic things like clothes washing if needed. Dunedoo Central School will be organising this service. “If you know someone who needs assistance, they or you (on their behalf) can contact Joy Beames (0428 751 173) or Sam Barrass (0402 592 436),” said Annette. “As the fire continues to burn to the east of Dunedoo the advice from the Rural Fire Service late yesterday was that while there is no immediate threat to homes, if you are in the area of Cassilis or Coolah and in the vicinity of Warrumbungles Way, monitor conditions and be prepared to take action if the fire threatens your property. An information point has been established at the Coolah Sports Club. NSW RFS community liaison members are available to provide information and updates to residents. Please use caution when traveling in the area as there are reports of livestock and native animals on the road. Roads may also close at short notice for firefighting operations,” said Annette. Apologies for the late post, I was taking the scenic route home – Sydney to Rowena via Canberra and didn’t arrive home until early afternoon yesterday. In some respects it really was the scenic route with rolling hills covered in feed and bumper crops still to be harvested, being easier on the eye and the psyche than the dry, barren and dusty plains that awaited my arrival at home. I was certainly feeling very envious and my normally blue eyes were taking on a decidedly green tinge. I detoured to Canberra so that Queensland CWA President, Robyn McFarlane and I could meet with the Chief of Staff and the Senior Advisor to the Hon. Barnaby Joyce, Minister for Agriculture to discuss our concerns regarding the increasing severity of the drought, the perceived complexities of applying for assistance and the cumulative pressure on landholders and communities. Although we weren’t able to achieve any real outcomes we were afforded around ninety minutes to openly discuss the issues we wanted to raise as well as plead the case for those going into their third year of drought. We are grateful to Diana and Craig for their time and their commitment to keeping the lines of communication open. Both levels of Government are now firmly focused on preparedness and self-reliance; fair enough, but make sure your promises of increased returns to us, from free trade deals, don’t end up as empty as the food bowl has been. 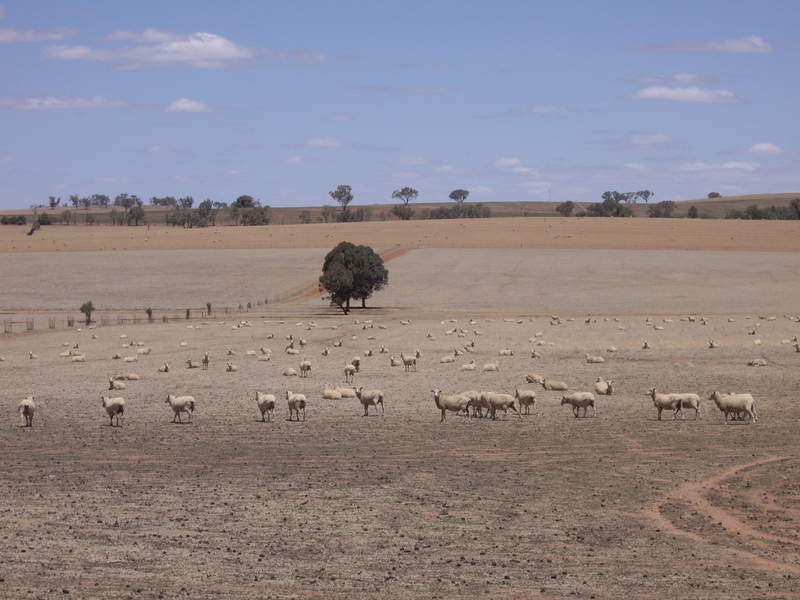 The CWA of NSW Disaster Relief Fund continues to accept donations for drought affected farmers and communities and all donations over $2 are tax deductible. Click here if you would like to make a donation. Perhaps you might consider adding rain for drought areas on your wish-list for Santa. 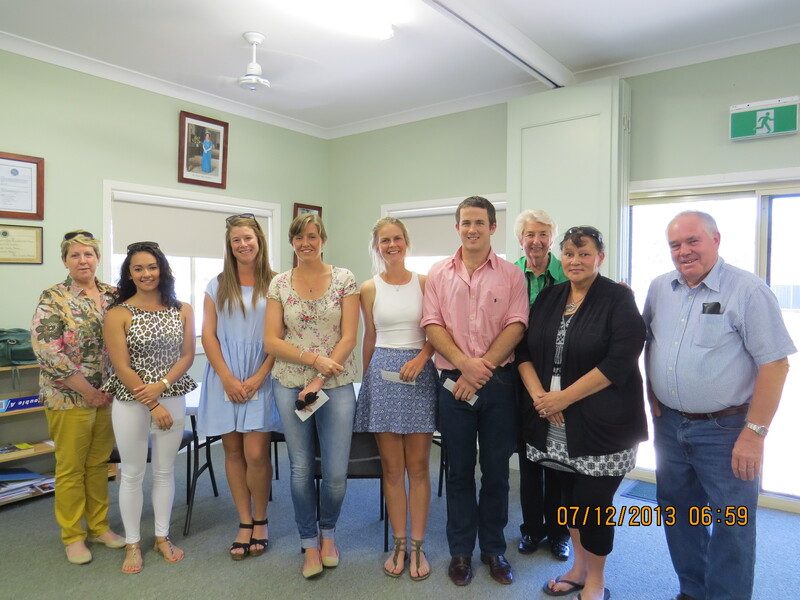 Margaret Barrett (adjudicator and past recipient) Sky, Elizabeth, Sam, Sarah, Fergus, Self (convenor), Jessie Richardson (adjudicator and past recipient) and Don Ramsland (Walgett Shire General Manager and adjudicator). Walking into the chemist in Dubbo the other day a voice said “Hello Mrs Roughley”. I looked up to see a girl in her twenties and realised I knew her. Tash was one of the recipients of our medical grant, started by Barwon Group CWA in 1998. Tash had completed her Pharmacy degree and was hoping to be back working in our local area within a couple of years. For me it was a reminder of the reasons we decided to raise money from the community to support our kids through their tertiary studies. We started small, only one recipient of $1000, made possible by the generous support of local business & the community. 15 years later we distribute up to $15,000 annually amongst 5-10 students. Since its inception we have assisted 85 students & distributed over $113,000. Many local businesses have come on board as regular sponsors with generous donations. Early supporters included Walgett Shire Council, Walgett Pharmacy and of course Barwon Group. We decided to focus on the rather broad “medical” area including Pharmacy, Radiography, Physiotherapy, medical support services and Allied Health courses, as well as Nursing and Medical degrees. The applicant can be enrolled at any recognised educational institution and their home base must be within Barwon Group of CWA (comprising Walgett Shire, Pilliga and Goodooga Districts). The grant to the applicants is based on an interview to assess personal merit and their willingness to achieve. When selecting candidates the adjudicating panel takes into account the financial support each applicant already has in the form of other scholarships, family support and so forth. It is not unusual to grant a small bursary to the same person 2 or 3 years in a row if we feel they are particularly reliant on the funds and their record of attendance is good. The money can be used however they wish to spend it. By giving small amounts (with no strings attached to as many as possible) we hope to encourage the next generation of professionals to return to the bush once they have attained their degree and completed their work experience. Records show many have returned to rural placements including the Flying Doctor and the Walgett Aboriginal Medical service. Two of the adjudicators this year were past recipients. It is great to see that not only is the grant working in terms of assisting local kids to further their education, and then bringing those skills back to our community, it is continuing to find support in the form of volunteer panel members and financial assistance. As a founding member of the medical grant, it is an endeavour I am particularly proud of. I look forward to seeing many more faces returning and would love to see more organizations start similar grants or scholarships for other areas of study. Walgett Shire actually did this last year. Our country towns need to have good services to keep people wanting to live in and around them. “Have you been a recipient of a grant or scholarship or organised one”? The Barwon Group Medical Grant is one of many forms of assistance provided across the state by CWA members to help students in rural and remote areas to achieve their goals. My reason for adding to Jill’s blog is the very real possibility that projects like ours (and more importantly the studies of the students we support) will become another victim of this terrible drought. How can we, in all good conscience, seek sponsorship from small businesses now struggling to survive themselves because of their reliance on the surrounding agricultural industry? This assistance will more than likely not be available and the added financial burden on families will mean studies will have to be deferred, or forgone altogether. In an attempt to try and alleviate some of these stresses for drought affected families we have today donated $50,000 to the Rural Financial Counseling Service of NSW (RFCS), to be distributed to those most in need, for whatever they need most. By supporting them we will also, eventually, be supporting the small businesses that sustain our communities – swings and roundabouts, Mr. Hockey! We hope to continue our support through the RFCS and if you would like to help keep the roundabout turning we are accepting donations through our Disaster Relief Fund. Click here. All donations over $2.00 are tax deductible.